Our native Spotted Joe-Pye-weed is a plant of wet areas, which are plentiful in Westborough. Besides the invasive purple loosestrife, what tall wildflower colors the late summer landscape purple? It's our native spotted Joe-Pye-weed, named after a Native American from folklore. Spotted Joe-Pye-weed (Eupatorium maculatum) grows about 5 feet tall or more and has flat or dome-shaped clusters of closely packed purple flowers. It has whorls of leaves and a purple or purple-spotted stem. The stem is the reason the plant is called "spotted" Joe-Pye-weed. The plant is named for Joe Pye (or Jopi), who, according to folklore, was a traveling Native American medicine man. He is said to have lived in New England around the time of the American Revolution and may have come from a tribe in Maine. He apparently sold medicinal herbs to the colonists and treated typhoid fever with this plant. By another account, Joe Pye wasn't a Native American at all, but rather, a promoter of Indian themes in the 1800s. He supposedly used the plant to treat typhus fever. It brought on sweating, which was considered helpful for fevers. Spotted Joe-Pye-weed is a plant of wet areas, which are plentiful in Westborough. It grows in stands in damp meadows and roadside ditches and along the edges of sunny, swampy areas. You'll find it along the side of the Lyman Street opposite Lake Chauncy beach. This plant is a perennial that typically blooms from mid-August through early September. In some fields, its dusty-purple flowerheads poke up above the goldenrods, creating a purple-and-gold vista. In the past it was popular as a cut flower. The flowers provide nectar for pollinators such as bees and many kinds of butterflies, including sulphurs, swallowtails, monarchs, fritallaries, and skippers. The plant can also pollinate itself as the male and female flower parts brush one another in the dense flower heads. Whether the Joe Pye of folklore is fact or fiction, the plant that bears his name has a history of medicinal use going back to the Native Americans and early colonists. Native Americans made a tea from the whole plant to treat urinary and kidney problems, gout, and rheumatism. A tea from the root was traditionally used for fevers, colds, chills, and various other ailments. 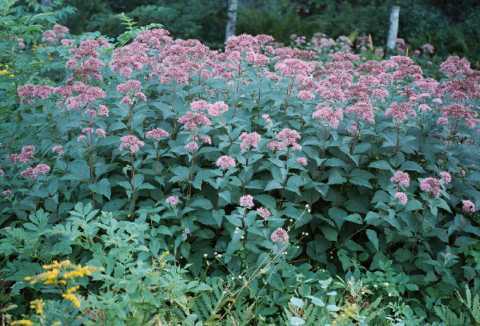 There are a few different types of Joe-Pye-weed, but spotted Joe-Pye-weed is the most common in our area. 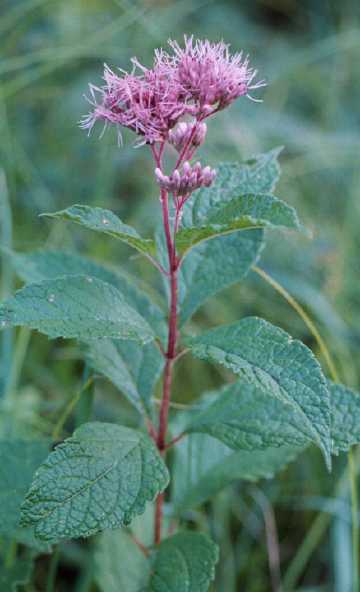 Spotted Joe-Pye-weed grows in stands in damp meadows and roadside ditches and along the edges of sunny, swampy areas.